The post contains the abstract and poster presentation. Hodgetts, D., Joyner, K., Mummery, K., Duncan, M., & Dobele, A. (2006). Viral social marketing: testing the effectiveness of the internet to effectively disseminate physical activity promotion messages. Journal of Science and Medicine in Sport, 9(Suppl. ), 36. 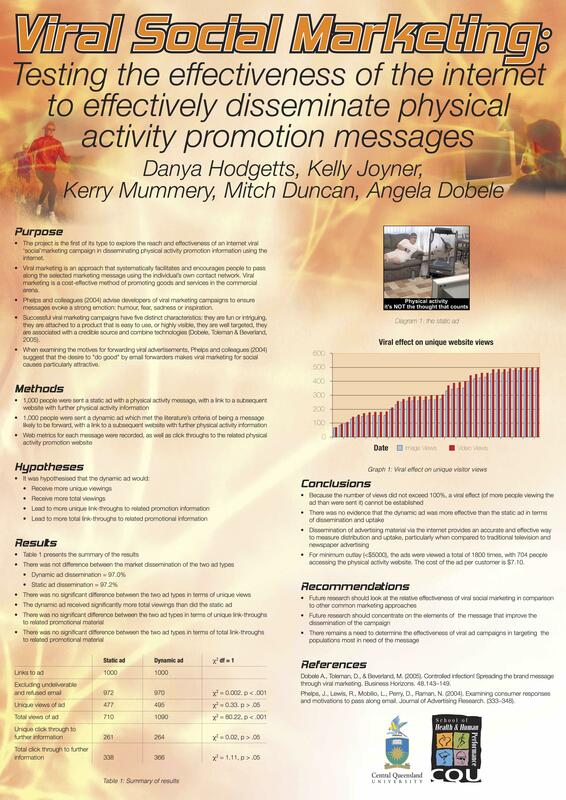 The project is the first of its type to explore the reach and effectiveness of an internet viral ‘social’ marketing campaign in disseminating physical activity promotion information using the internet. Social marketing is the application of modern marketing techniques to improve social well-being by changing attitudes and behaviour in regard to a specific product or concept—in this case health-related physical activity. Viral marketing is an approach that systematically facilitates and encourages people to pass along the selected marketing message using the individual’s own contact network.